Garvald is a pretty little East Lothian village, lying South-East of Haddington, South of East Linton and East of Gifford. It sits in a valley at the foot of the Lammermuir Hills, and alongside a burn called the Papana Water, on what was an historic route from the Borders to the coast. The village is built almost entirely from red sandstone giving the village a distinctive character. There are many listed buildings and the village itself has been given conservation status. At the East end of the village stands the Parish Church, which was built in the 1100s but remodelled in 1829. It is bright and airy inside, and still used for worship every other weekend. At the west end sits the former Free Kirk, with its free-standing bell tower, which is now the village hall. In and around these two buildings there are a collection of private houses. There is a small village green, and opposite that, the Garvald Inn and there is a large community park, woodland and childrens’ play area. In 1991 local historian Irene Anderson published a book which was updated and converted to digital format in 2017, see Garvald, the History of an East Lothian Parish (PDF/web version for viewing on a computer or tablet device). More information on Garvald can be found on Wikipedia and village photos are in the Gallery. For an aerial photograph of the village, see the ScotlandsPlaces website. In 2006 a new eco waste water treatment system using reed beds was installed. The photograph below was taken by local resident Graham Barnes for World Pinhole Photography Day on 29th April 2012, using a modern digital camera fitted with a plastic body cap (with a homemade pinhole) rather than using a lens. This results in slightly out-of-focus but artistic images. 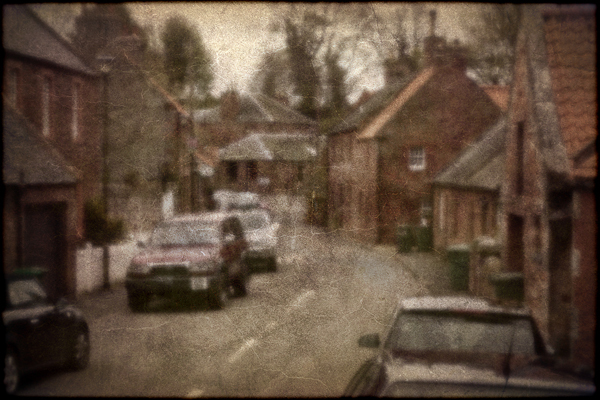 Another of the images taken in the village (called Whhoosh!) was selected for the World Pinhole Photography Day 2012 international exhibition. Before this website was set up, a regular edition of the Garvald and Morham Village Newsletter kept residents informed. Some of the previous editions are available here in PDF format. If you require Adobe Reader to view the document, click the link below to download the Reader software. We trying to trace the grave of my Wives Great Grandmother Hannah Sleep (nee Berg). Her Date of Death was 25th May 1907 and at the time she was married to George Theophilus Sleep a Gardener and her death certificates states she died at Castle Moffat Garvald at age 32. She had a hard life having already had 5 Children and died giving birth to the 6th. East Lothian Council have no record of her burial in Garvald or the 8 surrounding cemeteries and we wonder if she has been buried privately in the area, as family all maintain she is buried at Garvald. We visited Castle Moffat and spoke to a long term resident of the cottages with no success. We also checked Santa Maria Graves with no success and have searched Garvald Church yard as far as we are able. Any help would be appreciated as we have managed to trace 99% of the family and Hannah is the only missing part of the puzzle. I am wondering if anyone has heard of ‘Garlefoot’ or ‘Garrelfoot’ (Garrel Foot) in your area? I am researching a Douglas of Garlefoot, as written in a 1747 MS. While I have managed to find a place on Blaeu’s maps called Garrelfoot, it is near Biggar. I am looking for a ‘Garlefoot’ in the Linton Parish area. Nevertheless, Blaeu has the name written as ‘Garrelfoot’, but the OS survey name is ‘Garvald House’. So I am wondering if there is a connection linguistically at least? Another source (the Records of the Parliament of Scotland to 1707) mentions a William Douglas, younger of Garrelfoot, in the ‘Shire of Peebles’. I am an author, Jim Burnside, currently drafting a work of historical fiction, THE LONGEST NIGHT. Some of the characters and action derive from a family, the Macdonalds who lived in the village from the 1880’s through into the early part of the last century. Angus, father of two girls and six boys was a farm grieve, I believe for Lord Balfour. His two eldest sons, John and Angus became farmers, respectively in Killin and Haddington. The other lads all worked on the railways. One became an architect. My great grandmother’s family, the McSweens owned a meat packing business somewhere in Haddington. I understand that there were three breweries in the area, as well as three wealthy landowners – the Hays and Whittinghames as well as Arthur Balfour. Does anyone know if there were public houses other than the Garvald Inn? Irene Anderson mentioned that there were 4 inns at one time in Garvald. A link to her book is further up this page (see page 37). Hope you can help. We had a walk round your lovely church last week as we are trying to trace the burial place of Hannah Sleep, wife of George Theopilious Sleep, who was a Gardener at Castle Moffat at the time of his wife’s death on 27 May 1907. Any help or contacts you can provide would be appreciated. Am I correct in thinking Irene Anderson has passed away? We met her and bought her book on Garvald some years ago. I can trace my ancestors in Garvald to at least 1752, but nothing before that. I wondered if anyone had taken up Irene’s ‘mantle’ or whether you have been contacted by any others of the Dempster family. Many thanks. Yes, she has passed away. I edited and updated Irene’s book with recent history in 2017 to make a digital copy so it could be kept for posterity and archived with East Lothian Council. There is a link to it further up this page. I’m looking for informaton re. Conquer family who lived in Garvald and Morham between about 1750-1850. The name appears in Haddington and Saltoun also before, during and after these dates. My daughter and I came to Gifford last year searching for our ancestor who according to my father was from Gifford. We couldn’t find any Hendersons in the church graveyard and left disappointed. But now thanks to electricscotland and scotlandspeople.gov.uk, we think we have found him, a Thomas Henderson whose birth was registered in Garvald/Morham parish, on May 29, 1827. We are searching for any Hendersons who might still live in the area. If you are a Henderson decendant, please do get in touch. Thanks for your help, and we are delighted to bring this information to light after searching for it for over ten years. The Thomas Henderson, (born 8 May 1827, baptized 29 May 1827) about which you write, is my great grandmother’s 1st cousin 1x removed. Thomas’ brother Robert (1778-1855) is the family through which I am related. Robert’s son, Robert (1816-1891) was the Henderson that ended up in Indiana, USA. If you receive any response to your query, I would be very interested in potential connections! Just had a visit home to Garvald and it was a great day, the church was looking great, had a lovely lunch at the pub. I wasn’t allowed in the pub by my mother in 1963 it just wasn’t the thing! Meal was beautiful. Sorry that all the old people (born there) are all gone. I wonder where? I have a few photos of the Garvald burn in 1955 and a photo of Africa our house in 1963 I’ll try and send them to you. Thank you all for keeping us up to date with Garvald. Regards, Hope, nz. Have really enjoyed looking at your website, and hope to visit you before too long. My ancestor George Dods was born in Garvald in 1786 (and died in Bristol in 1874). I believe that his parents George and Mary are buried in Garvald Kirk. I am seeking information on Christie family history. Five brothers John, Richard, Alexander, Peter and William emigrated to the state of Victoria, Australia in the 1850s. Several settled in the Byaduk locality where I still live. Any info or contacts would be greatly appreciated. Anyone have any information on the Hay family of Garvald? I have a John Hay marrying Agnes Neison in about 1734. He was born in 1709 and his father was William Hay. I have reached a dead end and need help here. I think William was married to a Beatrix Hauden or similar name. Patrick/Peter Skirving b. 1769 Leith South, married Margaret Hay on 06/06/1790 at Garvald. They had a son William Skirving b. 01/12/1793 Haddington. The Hay family is mentioned in Irene Anderson’s book, which can be accessed further up the page. Does anyone have any details of the history and residents of Tanderlane Farm (or House?) in the 1900s? My wife and I are researching family history, and we are trying to trace the life of a lady called Andrina Isaacs (or Andrina Pitcairn) who we believe was Housekeeper there from about 1930-ish, but we don’t know for how long. She probably had two young childen with her, David (b. 1920) and Ruth (b. 1922). Any leads anyone can offer will be very much appreciated. The Waddells lived at Tanderlane for many years in the 60’s-90’s. You might try Jean Waddell for clues. I just discovered that my Great Great Grandfather was born in the village so it was interesting to find this site and learn a little bit about the village. I came upon this website today by chance and was delighted to read that Hope Haggart had made contact. She had a brother, Lynn Haggart, that was pals with us in the late 40’s/early 50’s. The Haggarts stayed in the Cottage “Africa” just over the bridge on the way to Stoneypath Tower. I was not brought up in Garvald but spent much of my childhood between Garvald and Snawden Farm where we lived at that time. My Grandparents/Chrissie Murray lived in Loan Cottage, Garvald from the 30’s. Aunts and Uncles, the Saundersons, Samuals and Robsons, were all part of Village Life. The Village Policeman in the 50’s was killed in his garden by bee stings. Mrs Bolton ran the village shop and at a later date the Catloughs ran the Post Office opposite the swing park. The P.O.W. Nissan Hut was still on the village green and Brother Oliver from Nunraw, who had taken a vow of silence, would always give us “Boys” a lift back to the Village if he found us miles away. It was life at its best. My Mother always told me I was brought to Garvald on 24th February 1944 being the latest addition to the Murray/Wilson Family. My granny was Nancy Murray before she got married and she grew up in Garvald together with her 9 brothers and sisters. She was born in 1915 and passed away a few years ago. When she was still alive she and my grandpa took us to Garvald several times so that we could see the village where she grew up. She was very fond of Garvald too. Great to see and hear what is still going on in the great wee village of Garvald. Even in my days it was very active. I am always hoping that life could just be a wee bit like how it was. Was brought up in Garvald and would be great to see pictures of the village as it was in the 70’s. If anyone has photos of the village taken in the past, please contact us as we would like to add them to the site in a gallery of Garvald in the past and present. Good to see your post, Jimmy, and hope you are well wherever that may be. Heidi – you’ve done loads of work on the site – it looks fantastic!! !